Our core annexe range has been designed taking customer feedback into consideration, as well as our own experience. We have created a range of granny annexe layouts and floorplans that feel dynamic and are practical. 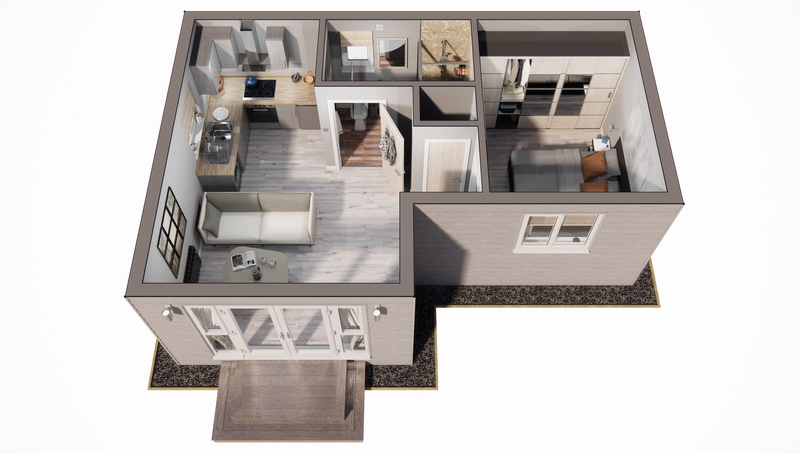 The majority of our annexes combine living and kitchen areas. Most of our customers find that in advancing age, open plan living is much more convenient and practical. Just one look online will show you that open plan living has become incredibly popular over the last ten years – not just for granny annexes either, people of all ages are embracing the open plan living life. An open plan kitchen and living area feel more sociable and are convenient for several reasons. When you are getting older, housework can become difficult and having to move from room to room to clean them, especially with a vacuum cleaner, can be tiresome. An open plan granny annexe requires much less cleaning due to its smaller size. Moving from room to room can also become difficult as you age – it may sound silly but even walking through to the kitchen to make a cup of tea can seem like a monumental task. With an open plan kitchen and living area, you have everything that you need close by to make eating and drinking easier. Everyone embraces open plan living because they enjoy the social aspect of it, and it is no different when it comes to the layout of your granny annexe. Imagine yourself cooking in the kitchen, whilst your partner is nearby watching television or reading the paper. Or if you are looking after a grandchild, open plan living is more practical for keeping an eye on them. Even if you have a relative who comes over and cooks for you, you can sit and relax in your living area whilst getting the benefits of enjoying your visitors’ company. An open plan arrangement can also be useful if you have mobility issues, it’s much easier to navigate around your home if you are, for example, using a wheelchair or standing aid. If open plan granny annexe layout isn’t your style, then not to worry, we also have some models that have separate kitchen and dining areas. Often called ‘broken plan’, our annexes that feature a distinct kitchen and lounge area retain the open plan feel yet are separate enough to feel like two different spaces. The Cadeby is a great example of this, featuring a generous living space, and a kitchen off to one side. The Wheatley also offers generous living proportions and a smaller kitchen, tucked to one side. When buying an annexe, the shape of your garden also needs to be considered. Most of our range is oblong shaped, but we also have a great option for awkward corner plots. The Dunscroft is our new, L shaped annexe which would suit a corner plot but still has a lovely open plan living/kitchen space. Available in three sizes, the layout of this granny annexe is dynamic, practical and would fit in any back garden nicely. When you are planning on building an annexe, it is also important to consider the layout of the kitchen and bathroom areas. Go for an annexe that maximises space but is practical for your needs. Luckily, we have taken out the hard work and our core range come in tried and tested layouts. Featuring kitchens that are easy to navigate around, and bathrooms that are ideal for those who are ageing. Our kitchens have simple, fuss-free layouts that enable you to prepare food and get around them easily. As standard, our annexes also come with a functional bathroom, situated next to the bedroom and containing walk-in shower cubicles, we also have the option to upgrade to a wet room if that is what you think would suit you best. Our annexe layouts are tried and tested and have been improved over the years by utilising customer feedback. However, if you can’t find a layout in our core range that suits your needs, we are always happy to talk about custom annexes. Contact us for more information and free consultation.